These Banana Oat Energy Bites are a great way to give your mornings the kick start that they need. Packed full of goodness, you won’t feel guilty for eating more! The taste of these Banana Oat Energy Bites is truly delicious. Not only are they pop in your mouth easily, but their flavor is simply out of this world, too. If you love a quick and easy snack, you’ll go crazy over these. If you love how these taste, you’ll also really like our Mini Pumpkin Muffins! My husband and I used to eat energy bars every morning before our workouts. However, these bars were SO expensive and didn’t really taste that great. That’s why I decided to start making my own energy bites. 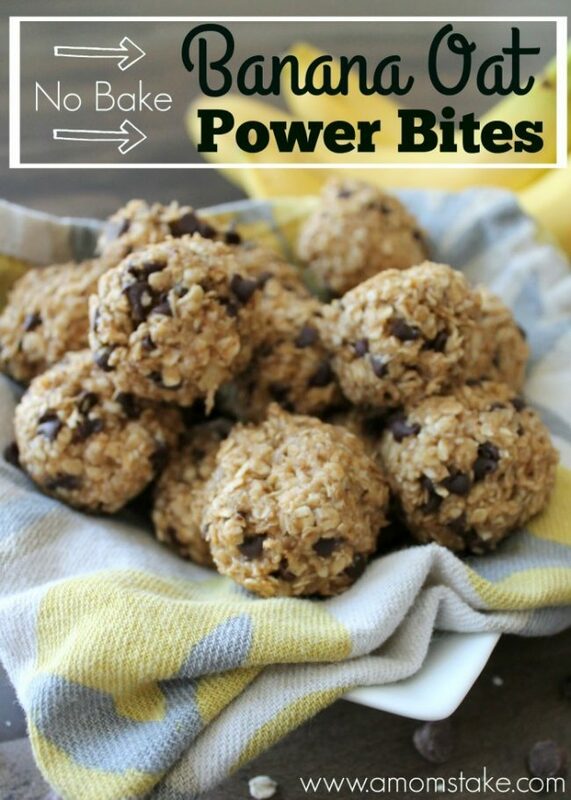 Made with only 6 ingredients, these super EASY no bake energy bites provide a great source of healthy carbs and protein to give you the energy you need during your workouts; and also work great as a midday snack. Plus, these No Bake Banana Oat Power Bites totally kick my cookie dough craving…and coming from someone who lives for cookie dough, that’s saying a lot! 1.Mash bananas with a fork. 2. Add peanut butter, honey, and vanilla. Mix until well blended. 3. Stir in quick oats. 5. Line a baking sheet with wax paper. 6. 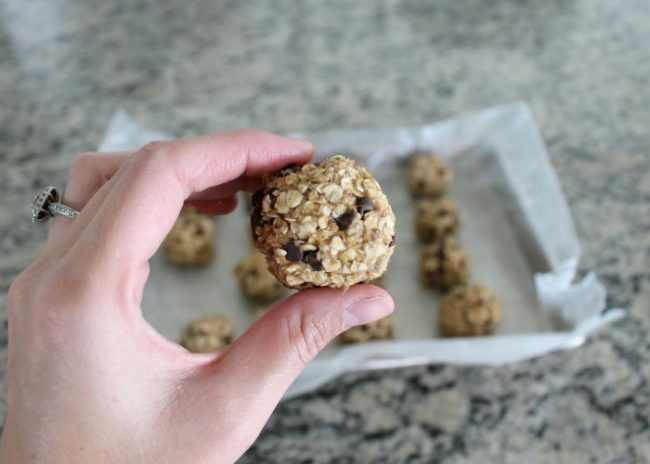 Using a cookie scoop, scoop your No Bake Banana Oat Power Bites onto your wax paper. 7. Roll your scoops into balls. 8.Place baking sheet in the fridge for at least 30 minutes. The longer you leave your Banana Oat Power Bites in the fridge, the firmer they become. Just as a little side note, I like to divide these into sets of 2-3 and place them in plastic bags in my fridge. This way they are ready to go for our crazy busy mornings! I typically store them in the fridge so they stay fresh and remain firm! Good luck keeping these stocked in your fridge, my family usually devours a batch within a day! To watch how quickly these come together, check out the video below! Q: How many should you eat in one sitting of these energy bites? A: Everything in moderation, but eating one or two in one sitting as the quick pick-me-up is always a great idea! Q: How ripe should the bananas be for this oatmeal energy bites recipe? A: When bananas become too ripe to eat is the perfect time to use them for this recipe. Q: Do you have to use quick oats for this recipe? A: Yes, quick oats work best for this recipe. 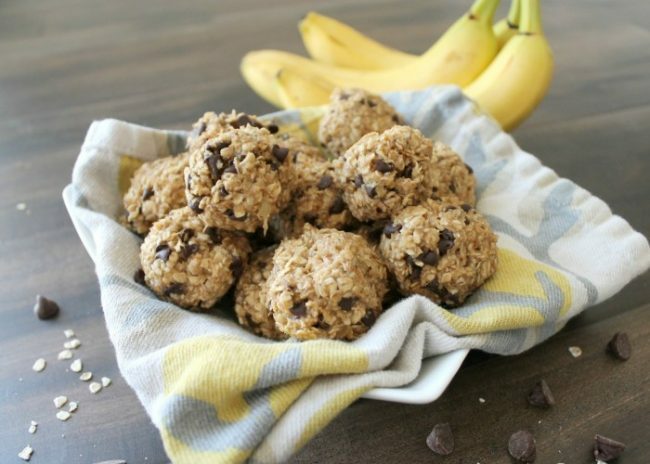 IF YOU LOVE THESE EASY BANANA OAT ENERGY BITES, SPEND A FEW MINUTES TO SEE THESE OTHER BREAKFAST RECIPES THAT WILL BE AN AMAZING PART OF YOUR RECIPE COLLECTION! Add peanut butter, honey, and vanilla. Mix until well blended. 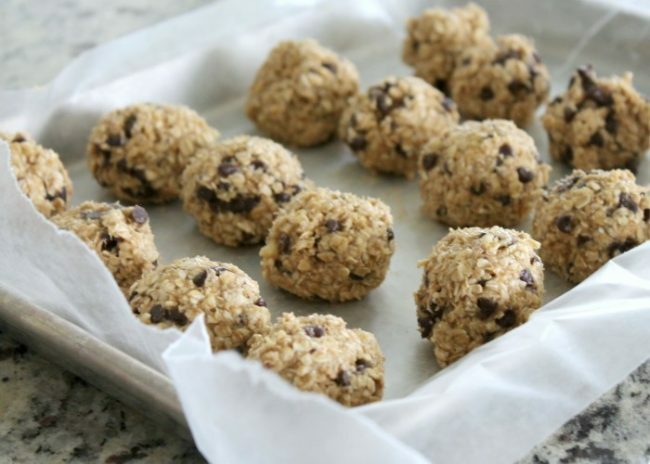 Using a cookie scoop, scoop your No Bake Banana Oat Power Bites onto your wax paper. Roll your scoops into balls. Place baking sheet in the fridge for at least 30 minutes. The longer you leave your Banana Oat Power Bites in the fridge, the firmer they become. Have you tried power bites before? I found out I have pre- diabetes. Your power bites sound really good only thing I’m allergic to bananas. Can you subsuite for any other fruit ? I’ve made these twice now and the batter is too wet to roll into a ball so I just scoop out and refrigerate. I even add more dry ingredients (hemp seeds and more oatmeal) to try to get it more cohesive. My only explanation is that my bananas are bigger. Otherwise, it’s delicious. What a nice idea for treat. Perfect for summer. This looks so delicious!! A perfect grab ‘n go breakfast! These do seem to be a perfect snack to grab for pre or post workout. It’s nice how easy they are to make also. Yum! I love anything that is no-bake and protein bites are so yummy. gonna have to try your recipe. I am always looking for new snack recipes to try. I will have to get the ingredients I need to make these No Bake Banana Oat Power Bites. They look so good. These sound so great for snacks for the kids! I love the no bake aspect! These look so good. I will have to make a big batch for my girls to take in their school lunches this year! These look absolutely delicious. I could snack on these all day long. You had me at the no bake! These look super yummy and perfect snacks for the kiddies! I’m always up for something that’s no-bake and involves oats. Will definitely consider this recipe for my newer, healthier diet. These look really good! I’m trying to find ways to get a little bit more into my diet because I exercise a lot more now. This will be a great way to do that. These would make perfect, well rounded snacks! I am looking for healthier ways to snack because I kind of fell off the healthy eating wagon. (I know, I know….) so now I need to jump back on. Starting next week I have a whole workout, eating routine planned and this looks like it will be a perfect addition! Thank you! Those are amazing! I love a healthy snack that’s also easy to make. You had me at “no bake”. I love it. We make no bake bites a lot during the warmer months. This banana variation would be a great treat on busy mornings.